Greetings in the name of the Lord. Blessed are all of you, my dear friends. Last time I talked about how evil came into existence. This question has bothered many people who cannot imagine how a God of love could permit the existence of evil. For those friends who are here for the first time, I suggest they read the last two lectures in order to understand this one which is a continuation. To briefly recapitulate, I explained how long before the existence of the material world, some of the created beings who had been endowed not only with free will but also with a certain power, abused this power. I explained how this Fall of the Angels, as it is called, happened gradually as a slow process of degeneration, whereby everything divine very slowly and gradually turned into its opposite aspect. In this way a separation occurred between those who had abused their power and those who had not. I have often said—and this applies to all beings, spirit or human—that your attitudes, your opinions, your feelings, and your thoughts create the spiritual worlds, even though you may still live on earth. You each create the world which will be yours. In the same way, the spirits participating in the Fall created new worlds according to their changing attitudes, dark worlds often referred to as Hell. The attitudes of disharmony and hatred created such forms. There is not just one possibility in this respect. Let us suppose, for instance, that a being in its perfect state had the particular characteristic of great strength of love, the fire of divine love. This love force would turn around into its opposite and create a fire of hatred and wickedness; thus a very disharmonious kind of fiery world would come into existence. So, you see, all legends are not as unreal as they might appear to you. Let us suppose another individual in his or her perfect state of development had the particular characteristic of wise judgement, calmness, and detached reflection. These attributes would enable the being to further the divine creation in a particular way through the slow unfoldment of this special creative power. Directed to its opposite force, this power would create a world of icy coldness, icy darkness, and desolation. There are many more possibilities of how the infinite variety of divine attributes can change into their opposites and create the corresponding spheres in the world of darkness, of which there is also an infinite variety, just as in the divine world. These spheres of fire or of icy coldness—in the spiritual sense, of course—are just two examples. There are spheres of slime and dirt, spheres of intense suffering through overcrowding or through isolation, and many, many other varieties. This state of affairs would seem to make the salvation of the fallen beings impossible; for even should they have come to the point of desiring to go back to God, they would not have had the power to do so since they were under the dominion and power of the one who reigns in the world of darkness. On the other hand, how could God not break his own laws and still save those beings who longed for him? If He were to use his infinite power by overruling the free will and the choice of those who decided to use the given power in their own way, He would actually be acting from the same principle as Lucifer. Here more than in anything else, maintaining the divine principle was of utmost importance, for only if God remained true to himself and his laws would there be a fundamental difference between the ways of God and the ways of Lucifer. Since it is God’s plan that every creature should recognize him and at one time come back to him out of free choice and reattain divinity, it was imperative that he not use the same means of force as his opponent, even though his purpose might be a good one. It is not the end alone that counts, but very much the means too! Only by remaining true to these principles would the most stubborn of the fallen beings one day see the vast difference between these two ways of being and understand the dignity that lies in the divine principles, even though it means a path of suffering for those who wish to get out of the self-created miserable circumstances. Since life in spirit is in direct relationship to the inner harmony, enlightenment, and general attitude, spirits who have become disharmonious cannot be simply put into a world of harmony as you might travel into a beautiful country. In the world of spirit the country is both you and your product. Therefore, the once fallen spirits had and still have to attain a state where again they naturally produce harmonious worlds. That this can only be accomplished through the same slow process of development as the Fall with its degeneration is natural enough. You will readily understand now that this must happen in free choice, too, so that questions like, “Why has God not done away with evil?”, need not come up any more in your deliberations. On the other hand, means had to be found so that the creatures who desired to return to God and to keep his laws instead of Lucifer’s could do so within the framework of the laws of God. Thus the free will of no one would be broken, not even of Lucifer himself. This is the great Plan of Salvation in which Christ played a major role. I will talk about this in more detail the next time. The spheres of darkness first came into existence where the spirits lived under the dominion of Lucifer. In the beginning there was no longing for or sense of the light they had once possessed. Only after tasting the self-chosen medicine for a considerable time, that is, experiencing a state of desolation, did a vague longing for something else—they did not quite know for what—take hold of some of these beings. It goes without saying that the memory of God and his worlds was extinguished to the degree that disharmony had set in, but it was revived again as attitudes changed. The latter could only occur as an exceedingly slow process, however. Spiritual darkness annuls knowledge, which is spiritual light. Just as with human beings, if you have no spiritual enlightenment, you have to work spiritually to regain glimpses of this light. The vague longing that first some and later more creatures felt was sufficient to bring a glimmer of light into their world, as though a faraway dawn changed the contours of their world a little bit. The cold would not be quite so cold any more; the fire not so hot anymore; the filth not quite so filthy any more; and the loneliness not quite so unbearable and hopeless any more. When enough spirits came into the state of longing and the longing increased, the time was ripe for the material world as you know it to come into existence. You may say that God created the material world, and this is true, for nothing can be created without the creative divine force. However, it is equally true that the material world was also created by the longing of enough spirits for something higher. The world in which you are now living is the product of the desire to strive higher. Here conditions exist in which spiritual development can proceed, and in which a free choice for God can be made—which is impossible in the worlds of darkness. In other words, this earth sphere is a product of the longing of the fallen spirits. And it is equally a product of the longing of all those beings who remained with God and whose deepest desire was always, and is always, to bring their brothers and sisters back to God. Therefore, both the divine worlds and the worlds of darkness helped in the creation of this earth sphere. The influence of both worlds exists and will manifest itself according to the attitude of each individual being on this plane possessing the power of free choice. Conditions and circumstances on this earth sphere are different, of course, due to the new form of matter; but then, circumstances vary in all spheres. Long before the fallen spirits developed far enough to be born as men and women, the spiritual life force first acted to create other forms of life. The original life force that works and manifests itself in each created being not only produced animals, plants, and minerals, but also other substances which were at first without self-awareness. Just as a plant is without self-awareness, so too were these substances. As time went on, more and more beings came into a state of longing for light. This would perhaps constitute the only feeling these beings had at that time. Very gradually, human beings came into existence in material form through various intermediate states. When this happened, a major phase was accomplished. This was the time when the first glimmer of self-awareness was born, or reborn, or re-awakened. More and more people came to live on earth. Only with self-awareness, which includes thinking and deciding, can development take place. All the forms of life which existed before human beings have been leading up to this point. You all know now that human beings produce their spiritual world. And on earth where the influence of God’s world also existed, for the first time since the Fall, they now had the opportunity to learn, to change, to turn to God and thus to create a better world for themselves in both matter and spirit. They would go to the spirit world after the death of the body and also during sleep when the body rested. From the spirit world they would receive inspirations and influences of all sorts. This is why development cannot proceed faster; for all the incarnated beings were at first so low in their development that they were constantly influenced by their own sphere. If God’s world had not acted on this earth too, there would not have been any difference between the earth sphere and a sphere in the world of darkness. You must all realize, my friends, that I can give you only a very rough outline of all this. This touches the very greatest questions, which cannot be fully understood by any human being, for both human language and human understanding are too limited. Therefore, as a rule I do not even like to talk much about all this because the main thing for you is to learn to know your own soul and to develop it spiritually. However, human beings often wonder about these fundamental questions, not merely in a spirit of superficial curiosity, but in good faith. And ignorance and wrong conceptions of some of these points may seriously hinder your development. This is why I have been charged to give this series of lectures, even though some of you may not yet have sufficient inner perception to sense and feel the truth and deep significance all this information holds in general and also for your own lives in particular. How did the influence of the world of God manifest itself? Could angels of God guide and inspire the human beings who were incarnated from the spheres of darkness? This would be an impossibility since according to universal law an individual human being has to make the first step in order to receive help from the world of God. How could this step be made if the whole entity was still so coarse that it had no inkling of God, no idea of his world, and no notion of what to do? On the other hand, God’s world co-created this material earth and thus, according to the law of free will, had the right to manifest its influence on earth. The answer is that pure spirits who remained in the divine worlds were incarnated at all times. To be sure, very few were incarnated at one time, but the influence of one such being outweighs by far the strength and influence of a hundred creatures of the world of darkness. The spirits who were incarnated from the world of God brought with them light, love, and wisdom. They fulfilled a great mission with their incarnation on earth, and their influence was much more far reaching than might have appeared at first sight. 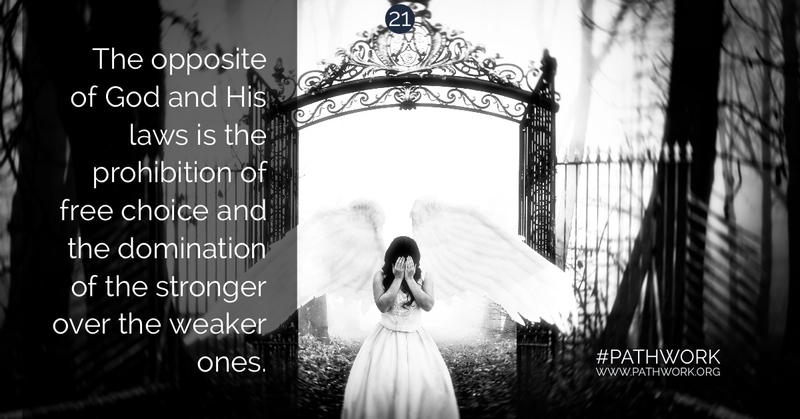 With this influence growing steadily through the ages, the fallen spirits during their incarnation on earth could freely choose what side to listen to: the side that reached their lower nature or the side that seemed to push them ever upward regardless of the difficulties encountered. By such free choice, God’s law concerning this aspect of life was not violated. Communication with the beyond took place not only through guidance and inspiration, but—what always existed and what will exist—through a more direct form of communication, namely what you now call mediumship in various forms. Communication with spheres of the beyond depends entirely on the attitude, goal, and general development of the medium as well as of the people using the channel. During the early times, human beings who were fallen spirits could not have any communications other than with the world of darkness. But the pure incarnated spirits had communication with the world of God. And this so strongly outweighed the danger and damage of communication with the Luciferic worlds that it was indeed worthwhile. If communication with one world could exist, a connection with the other was within the law. If one had been impossible, then the other would have had to be equally impossible. Incidentally, this is where some human beings make a great mistake when they reason that any communication with the beyond is Luciferic and dangerous and even claim that it is the only possible one. Human development could not have proceeded at all in those early times if the pure spirits who were occasionally incarnated could not have made a very direct connection with the world of God from which truth could come to humanity. To have this benefit and remain within the framework of the divine law, an equality had to exist so that each individual could make a free choice. An equal influence had to come from both sides. This meant fewer beings of the divine world living on earth, because their strength always outweighs and outlasts the influence of evil. However, especially during the early times, a great interchange existed between the material and the Luciferic worlds. The dark spirits claimed to be gods and to favor human beings with all sorts of grants if they, in turn, would follow what the Luciferic spirits dictated. Despite all this harm and danger, the few communications which were established with the world of God made up for the damage a hundred times over. The incarnated pure spirits had enough enlightenment within themselves to spread divine truth as well as the necessary requirements to be in communication with the world of God as instruments. For without the mediumistic connection, not enough truth could have been given to humanity. Even though the pure spirits had no evil in them, the material shell of a body took so much energy away that the teachings coming from within their own selves would not have been sufficient. Truth was spread in the manner that humanity at each particular period was ready to absorb. This went on for a long time. Gradually more of the once fallen spirits came into the state where they could recognize God. Their longing became conscious and meaningful. Their will could now be developed to overcome the evil impulses of their lower nature. The change that began to take place had a much greater effect than can be easily realized. Not one of you fully understands that if a single person develops really well, doing the best in his or her power, this person does not only help himself but adds the most valuable cosmic power to a great reservoir. It will ultimately have a very decisive effect that will spread considerably, even though the person may not see even a part of this effect. As people change, they might see some of the effect in their immediate surroundings by noticing how all of a sudden their fellow-creatures begin to change a little bit, due to their own change. But people will not know, as long as they are on earth, how far-reaching the effect of the smallest endeavor in this direction is. No such endeavor is therefore ever in vain, my friends! It is as though you threw a stone into a pond of quiet water. A ring appears around it, then come more and more rings, until they extend so far that your eyes cannot follow them to the outer periphery, but the rings are still there. If one person overcomes a single weakness, it constitutes the best help in the great Plan of Salvation. Next time I will continue from here and talk in greater detail about the part Jesus Christ has played in the Plan of Salvation. And now I am ready for your questions, my friends. QUESTION: The dissection of Einstein’s brain showed no marked anatomical differences between his brain and the brains of other human beings. What is, in a metaphysical sense, the brain as the physio-psychological vehicle for intelligence and intellect? ANSWER: This experiment is the very best example to show that intelligence is not in the physical body. The ability to think, to create, has nothing to do with the physical organs, unless, of course, the physical organ is damaged, which would affect the corresponding subtle body. I think most of you know that all thinking takes place in one of the subtle bodies, just as all feeling is in another subtle body. The subtle bodies, as development proceeds, will integrate and eventually become just one: the spiritual body, where all purified and perfect thinking and feeling will have integrated into the last, ultimate and eternal subtle body. Until this is accomplished, there is division, each function belonging to a special layer or subtle body. The physical layer has as its sole function the physical life in its various aspects. But thinking or feeling belongs to different realms and therefore take place in a different layer or body. QUESTION: Could I hear a few words about bodhisattvas in relationship to Jesus Christ; is there any relation? ANSWER: There is no relation in a direct way. The word you use—we have different terms—designates a special type of being in the divine world. All created beings had originally a particular divine aspect, specially developed, and the purpose of creation was that each being would complement the creation by furthering other aspects through development, so that perfection would be reached not only in one aspect, but in all. This is how the power of creation could have been used by all beings, but was only used by those who did not abuse this power. Absolute perfection exists only in God and in Christ, who has most of the divine substance. The perfection of all other beings is a relative one, but it could become perfect by their becoming co-creators. The so-called bodhisattvas are beings endowed with certain particular aspects of divinity, each representing a different one. This one aspect is their particular force with which they help in the great Plan of Salvation in very special ways and by various and special means. But until the plan reaches its completion, the pure beings use their efforts to help others with their particular strengths. The plan of creation will only come to its full conclusion as each being perfects himself or herself in all ways. Now only Christ, except of course for God, is perfect in all ways, and has all talents completely developed. All other beings have their characteristics with which they were created—God leaving it up to them, that is, all of us—to continue his creation ourselves, by developing all other characteristics, aspects, or talents in a perfect way. So it is not quite correct to say that all created beings were once completely perfect, as the Absolute is. We were perfect in our own ways which, of course, is always relative. You can be perfect within the frame of your present development, for instance, but that does not mean that you are absolutely perfect. Someone of a much lower development than anyone of you here can be relatively perfect compared to others, of whom more can be expected. So perfection remains relative as long as the plan of creation is not fulfilled, except with God and Christ. And this should answer your question, for the beings you have mentioned are perfect only in some ways, while Christ is perfect in all ways. QUESTION: Last time, you answered the question about willpower and self-control. I think it is important to see oneself in one’s true reality to achieve self-understanding in order to improve oneself. But how can one attain this self-knowledge? ANSWER: This is a very good and very important question indeed. Of course, I speak a great deal about this subject to my friends with whom I work privately, and I have also treated it occasionally in general lectures, but this is so basic and important that it cannot be stressed enough. As you rightly say, before willpower and self-control can be strengthened, you have to have a certain amount of self-knowledge so as to have a clear-cut idea why you want to develop your attributes, what is your goal, and in what direction should willpower and self-control be utilized. In order to have willpower, the goal has to be clear in your mind, yet to find out your true goals and wishes, and most important of all, to gain self-knowledge, you definitely need some willpower already to begin with. Thus the process works both ways. The first step in the proper order is to establish what the issues are, why it is necessary to have self-knowledge. What are its advantages? How costly is it to attain? What are the disadvantages of not having it? Once you clearly understand this, you can make the proper decision. You will gain clear understanding if you set out to think about it objectively, disregarding the resistances of your lower nature. All you have to do is not shirk the issue and think things through to the end of the road. This is not so difficult; it merely requires a little bit of courage and wisdom. Everybody has some courage and wisdom within, and it is only a question of letting it come to the surface. As with willpower, here too, it is a question of deciding, of making up one’s mind once and for all. This can be done only by considering all sides. The trouble with people is not that they cannot do this but that they avoid those decisions concerning their inner life. They run away from them, sensing it might be uncomfortable; they prefer to cover up the issue, instead of viewing it with clear eyes and an open, unbiased mind, not pampering the lazy self that likes to wallow in the swamp of self-indulgence. So the why of the trouble and discomfort of self-knowledge has to be established. These questions are not so difficult to answer, at least not for a person who knows that God exists, even if many facets of him and his creation are still ignored. Even if your belief is feeble, but you follow the thought to the end, the understanding must come that it is necessary to develop oneself. And self-development cannot be done without self-knowledge. Self-knowledge is the only thing that really counts, my friends! Nothing else is any good, nothing else will ever bring your development about, enable you to have real faith and real love, for God above everything and for your fellow-creatures as for yourself. You have to begin with yourself before you can attain the freedom and harmony you all long for in your innermost being. No matter what path you choose, if it does not contain complete self-knowledge, or does not make it a major requirement, you will accomplish nothing, no matter how much you learn and read and do this or that. All this counts for nothing, unless you use the knowledge you acquire as you follow the path of soul-knowledge. Now how to accomplish this? Of course, it is not easy. But its rewards are the richest, for this path is the only one that will bring you liberation. So it is only logical that it cannot be easy. It means, in the first place, to be able to humble yourself. No one likes to hear that, my friends. For self-will and ego and vanity exist in every human being and are the strongest hindrances to perfection, faith, harmony and love. Whatever the various individual faults can possibly be, this applies to each and everyone who goes through the cycle of incarnations, in other words, who is not a pure spirit. If you want to gain self-knowledge, you have to reconcile yourself first to the idea: “I have to do what is most difficult for me.” For that is the key. If it is most difficult for you to show having a weakness, then to show that is just what your soul needs to struggle free of its chains. Or if it is difficult for you to give up your vanity, or your selfishness, then that is where you should jump in—freely, because you choose so, not because life forces you. You see, my friends, the divine laws are made in such a way that the things you need come to you. But it will be so much easier if you meet them halfway, if you decide on your own accord, “I want it because I obviously need it” and then step into it yourself. If life forces or pushes you into it, against your will, it will not only be so much harder but it will come to you again and again, until you have learned through self-knowledge that you need what life gives you, and to meet it freely yourself. Then the lesson will be learned and life will have other things to offer you. The more purified you are by this process, the less you will need unpleasant experiences. Or rather, what used to seem unpleasant will not be so any more. You cannot avoid what you need, that I can assure you. Until you have met it out of your own accord, with the realization and understanding of its necessity for your character, it will not cease. Please remember that, all of you. In order to gain self-knowledge, you might, for instance, sit down and ask yourself, “What is most difficult for me to do in my daily life?” Perhaps for some of you the most difficult thing will be to admit the truth, for whatever motive. For another, it might be humiliating to show yourself as you are without a mask and without the superiority with which you try to impress people. For yet another it may be most difficult to be modest, to remain in the background; for another, to give something, whether materially or spiritually. Everyone has different difficulties, and each one of you can find out about them comparatively easily, if you really try. You do not have to think very far; think of your immediate reality, your life right now. View every day that passes from that point of view. And you will, after some trying and training, come to see your reactions quite differently, I assure you. You will learn to recognize emotional reactions that you had been completely unaware before. Your immediate outer problems are only the effect of some cause which is hidden from you, but not so deeply that you could not so easily recognize it if you only practiced what I say here. Then the connections will appear so clearly in front of your eyes that you will be shocked at yourself for not having seen all this in the past. Making the connection between your troubles and their causes, which you subconsciously yet deliberately had pushed out of your awareness, will have a blissful effect on you. It will make you happy the way only truth can. It will liberate latent powers and healing forces for your body and soul. If you experience this regularly, then you can be quite sure you are on the proper path. But because the temptation is always so great to put all this aside, you should be prepared to do battle with it every time anew. After a time, this temptation will cease. But at the beginning it will require considerable effort to guard against your lower self that tries to stifle the aspirations of your spirit. You may be the loser if your outer self allows all the “excuses” your lower nature furnishes. Of course, I speak very generally now, not just to answer a personal question. This applies to everybody. Make a list of your faults. If you can think of only two or three, then you have proof that you do not know yourself. And then you can avail yourself of the opportunity of self-purification and self-knowledge by doing what seems at first so difficult. Ask the people around you to tell you what your faults are. This will give you knowledge about yourself and will teach you the humility you need. For as long as it is difficult for you, it is a telling sign that you need just that very badly. If it is easy for you, if you do not feel resentment, resistance, or any kind of heaviness within, then it is not important any more. It does not matter what you try to tell others; it matters how you feel when someone tells you of your shortcomings. If you observe clinically what you feel when that happens, if you do not want to fool yourself about it, you will know where you stand spiritually. This is the only way you can become really detached, my friends. When your own shortcomings in the eyes of others do not matter any more, when your humiliation does not matter any more, then you are detached—not when you avoid the things that bother you. This is difficult, at least at the beginning, and perhaps not everyone is ready for it. Some may need more time, more knowledge, more dabbling at the fringes before they can really go on the path; but whoever does it will, indeed, become free. God will help you through all the further stages of self-realization if these initial steps are taken. So my advice is this: First, think about what, in relation to other people, seems most difficult for you. After you have found this out, consider with what trend in you this might be connected. And then decide whether you are really ready to overcome whatever chains you in this way, not only for the sake of your own freedom, but for the sake of God, for the sake of your own spirit, your higher self, for the sake of your development, for the love you could only then give and receive, for your complete fulfillment. Are you ready to do that? How many of my friends here are? And then, if you have decided with a big and wholehearted Yes, you will need your willpower, my dear ones. You will need willpower and self-discipline to battle all your faults, which can never happen by pushing them into the subconscious, by merely covering them up so that they do not show on the surface. For do not believe that something you are unaware of does not exist. The process of eliminating your faults, which is the next step after self-knowledge, is a very different one. Briefly, the process is this: Watch yourself first as you really are, without vanity, without wanting to be better or more than you are at this point. Simply take stock and get accustomed to seeing yourself where you really are and not where you want to be. Accept your temporary reality for two reasons: 1) You have to be unemotional and undisturbed about what you are before you can change yourself. This requires the new habit of seeing yourself clearly, without any false motives and excuses and blindness, for a while. 2) This will also teach you the necessary humility that is a major requirement of spiritual development and true detachment. Accepting yourself as you are does not mean that you should remain this way. The ultimate goal must be to change the negative trends, but this cannot be done before you have accepted entirely the stage you are in. Thus, observe yourself daily when and how your faults manifest, not only outwardly, but also in your feelings. By observing your reactions you will learn to ascertain how far you have to come toward accepting yourself without embellishment. After this stage is mastered, the next one can begin: by meditating on what the opposite of any particular fault is; how you might react and feel if you had already achieved the transformation. If you do this faithfully for a while, asking God for inspiration, help and strength, you will begin to feel differently. Your new inner reactions will leave you so free, make you feel so wonderful! You may also meditate on how each of your particular faults is a direct hindrance to the unfoldment of love. For each fault is just that. It blurs the love force in the soul. If you proceed in this way, God will inspire and guide you, you can be quite sure of that. As I said, this is a difficult path. But blessed are those who take it, who have the courage and the wisdom to do so. I know, my friends, that I have given you strong medicine. No one likes to hear these things. It would be so much more pleasant to hear what is easy or is impersonal. But, unfortunately, that would not correspond to truth. And since I am a spirit of truth, of the world of God, I have to give you truth, whether it is comfortable or not. Yet, bitter as the medicine may be, I think that if you open your hearts, you will feel the love I have for each one of you. Love cannot come from any other side but the side of God’s world. And you should never be grateful to anyone else but God. Whether it is through me or another spirit of the world of God, no matter how much you may be helped, no created being is anything without God. The higher developed a creature, the less it will want honor and admiration. That is due only to the Creator, without whom we are nothing. This applies to us spirits just as much as to you humans. When you are accomplishing something—whatever it may be—realize that it is only through the grace of God that you can do it, not through yourself. By yourself you are nothing. And the highest created being in existence, Christ himself, has said so, time and again. QUESTION: I understand that when we are incarnated on earth we have certain limitations in our spiritual development. Is it possible to burst this, to go farther than the limitations which are set for us? ANSWER: Oh yes. I will say this, however: You cannot accomplish everything in one incarnation. That would be impossible. But you can certainly break the limitations. That happens quite often. It can only happen by what I have explained in the answer I gave before about this noblest of all paths. If a person really has the will, and if this will is put into practice, then the limitations will recede and much more can be accomplished in one life. What you can accomplish in one incarnation by taking this path would perhaps need twenty otherwise. That is the difference. This example should give you an idea of your power to break the limitations. ANSWER: In the first place, this is not the only possibility to take a path such as this, my dear. Certainly, the help that direct communication with the spirit world of God can give is a very valuable one. But everyone who has even the slightest possibility to take the path will be led somehow, somewhere to the right place, either to a person or to a spirit, so that he or she may receive the necessary material to work with. It may be through a church, or through a particular teacher, or through a spirit, or through a very strong direct communication by way of inspiration. The spirits recognize where the possibility exists; they recognize whether the desire is there or may be aroused, and they will guide accordingly. Everybody will get just what they need, you can be sure. The problem never arises that someone who is ready for the path may not have the opportunity to find it. This does not exist, my friends. The laws of the divine world work too accurately for that. The problem is much rather that a great percentage of people who could take this path and who are led to where they could do it, finally do not. Often the world of God tries again and again, offering different possibilities, but the essence is never understood, because people do not want to understand it. Just look at your own circle—and it is similar everywhere—many more come than stay and actually do it. Believe me, this does not happen at the cost of others who may not have such possibilities. Whether here or elsewhere, only a handful out of hundreds will really and truly take this path. Every great person, teacher, priest—any communication with the world of God—will convey the same: many people are guided to them, and a small, small part will fulfill the purpose of that guidance. The great majority of humankind, however, is not yet ready to take this difficult path of perfection. If in this life they learn just enough to become a better person, to accept that perhaps God does exist after all, this might prepare them for the path in their next incarnation. So, you see, the spirit world actually gives more people the possibility, just on the remotest chance, than there are people who take the opportunity. You can be sure that those who are not guided anywhere either have no desire, no real understanding, or not the remotest possibility in this life to change in this respect, or have already found what they needed and what is best for them in this incarnation. QUESTION: Could you please make clear the difference between the soul and the spirit? ANSWER: The spirit is the ultimate being, the indestructible being that lives eternally. The soul is one of the subtle bodies that will, eventually, disintegrate. Is that clear, do you understand that? I think what you want to know is how the two manifest, so that you may know which is which. Is that what you mean? [That is correct.] To have the spirit consciously manifest is, of course, not easy. This can only happen when spiritual development has reached a certain point, when a breakthrough has been accomplished in a person’s higher self. Then you will feel that something thinks within you, directs you, sends you messages, gives you deep and unquestionable knowledge—and all this does not come from your brain region where your normal thinking takes place, but from the region of your solar plexus. Your soul, however, manifests in your emotional life, in your feelings and in your subconscious. Even to become conscious of your feelings, a great deal of self-knowledge is necessary; most people are unaware of their real feelings and emotional reactions and are thus slave to them; they are mastered by them, instead of controlling and mastering them. To achieve this mastery, self-observation, objectivity, and self-criticism are essential. If what I advised tonight in my second reply is followed, the result must be, first, awareness of the soul, and then awareness of the spirit. I will answer the rest of the questions next time, my friends, for our time is up. I beg all of you, especially those who have come here for the first time: Do not be too hasty in your conclusions. This is such a vast subject, new in many respects even to some of my more regularly attending friends—and it may take a little time to adjust to new outlooks. Do not bar your vision by too hasty conclusions; think seriously and carefully, and do not let your unconscious emotions play you a trick by blurring your judgment. Be careful of that, for you may do great harm to yourselves. God’s blessings go to every one of you. Take this blessing in awareness, so that it may help you in your decisions, that it may strengthen you to recognize the will of God and act accordingly. Be in peace, be in God!